We are specialists in manufacturing high-end technical products, including containers for hot and cold potable water, and for the chemical, pharmaceutical and the food industry. 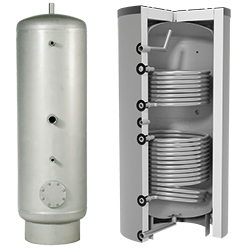 Our range extends to storage tanks, buffer tanks, pressure vessels, calorifiers, complete hot water systems, de-aerators, and water feeding vessels, gas coolers, filters, condensate containers and collector distributors amongst others. We use corrosion and acid resistant stainless steel from 1.5 to 10mm in thickness, with units up to 2400mm in diameter and 8000mm in length/height. We are particularly specialized in bespoke products made to our client’s specifications as well as an established standard product line. We employ highly skilled and qualified personnel at our plant in Tatabanya, Hungary. Quality assurance is continually monitored in-house, as well as required by local authorities and TUV Rheinland for complete peace of mind. All standards are approved and rigorously checked by the German TUV. The consistent standards of construction and the production cycle is guaranteed by our highly qualified, experienced and committed workforce. Customer service is our priority and is reflected by response to our customers’ needs and requirements. Long-term clients and their continued satisfaction is living proof of our commitment to standards and quality of products.